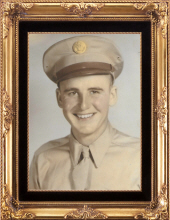 George “Did” Knauss, 95, of Bowling Green, Ohio, passed away Thursday, April 4, 2019, at the Bowling Green Care Center. He was born August 23, 1923, to Fredrick and Pearl (Snyder) Knauss in Dunbridge, Ohio. He joined the U.S. Army in the 1940’s. Shortly after being discharged he married Geraldine Curl on April 26, 1945 in Quincy, OH. “Did” and Geraldine raised 2 children and celebrated 65 years of marriage, before Geraldine passed in April of 2010. He worked as a glass inspector at Libbey-Owens-Ford, retiring after 33 years. “Did” was a proud member of the United Glass Workers Union Local 9, and he enjoyed to tinker in his garage. He was a people person and enjoyed speaking and spending time with others, especially his family, his children, grandchildren and great-grandchildren. At 95 his family remember him best for his independence, sharp wittedness and quality of life. “Did” is survived by his children: Tammy (Craig) Premo, Dennis (Susan) Knauss both of Bowling Green, 5 grandchildren, 7 great-grandchildren and nieces and nephews. In addition to his wife Geraldine, he was preceded in death by his parents, brother: Jack Knauss and sister, Cora Jacob. Graveside services will take place 3 p.m., Tuesday, April 9, 2019 in the Troy Township Cemetery, Luckey, Ohio. Family and friends will gather to share memories and officiate. Memorials may take the form of contributions to the: Wood County Senior Center or to a local foodbank of donor’s choice. Condolences may be shared with for the family at www.marshfuneralhomes.com. To send flowers or a remembrance gift to the family of George "Did" Knauss, please visit our Tribute Store. "Email Address" would like to share the life celebration of George "Did" Knauss. Click on the "link" to go to share a favorite memory or leave a condolence message for the family.